Spring has sprung in London! It may well be temporary as most British weather is, but it’s delightful while it lasts. I always find it so much easier to dress when the weather is nice, and to be freed from the annoyance of layers and tights. Here’s a closer look at the new jumpsuit. 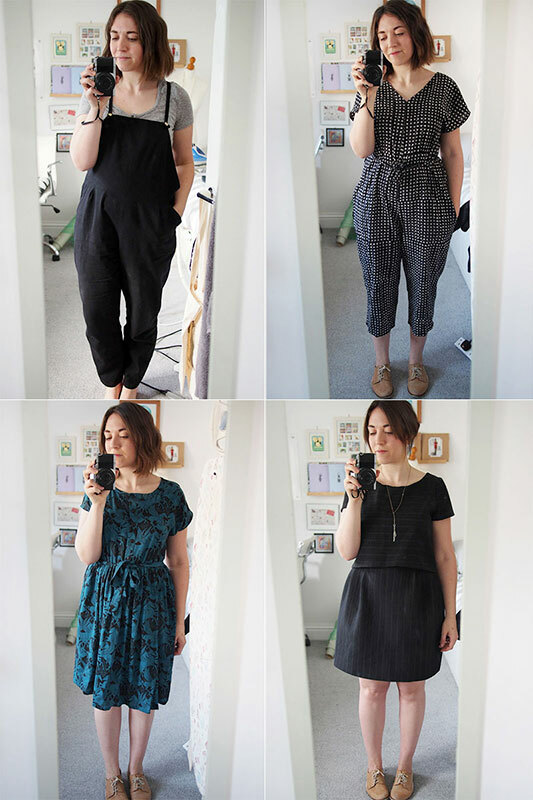 It’s fair to say by this point that I’m jumpsuit crazy. I think I wear them more than both dresses and jeans by this point, which will probably get borne out in my #MMM photos. So comfy! So practical and cycle-friendly! So quick to get dressed! And they’re fast and fun to sew to boot. I used Butterick 6312, grabbed during a Jaycotts pattern sale binge a couple weeks ago. 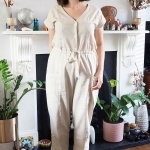 It’s about as basic as a jumpsuit can get: very wide and unfitted, cropped to calf, side seam pockets, and to be worn with an optional belt. 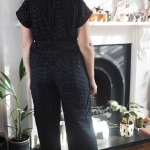 The pattern pieces look terrifyingly like a clown suit, but once it’s made up in a soft fabric and belted, it’s secret-pyjama dreams come true. The fabric is an indian handblocked cotton that I bought from IndianStores on Etsy. You may recall I have an Alder dress in the blue colourway: it’s so supersoft and lovely both to work with and to wear. If you’re intro handblocked prints and khadi cottons you should definitely check out that store. It took about 45 minutes to sew, especially since I dipped the back into a deep V and realised I could get it on and off without needing to add the centre back zip. The neckline is finished with self-bias and I French seamed the centre front-to-back seam to get a nice finish on the points of the Vs. After wearing it for a day I found the loose neckline slips around a bit, so I might go back and add a strap to the back neckline to keep it in place. It’s described as very oversized so I cut a small graded to medium around the hip, but next time I’d consider cutting XS/S as it’s still too big around the shoulder. Not perfect in terms of fit, but fun and easy to wear on a sunny day. Adorable! Love the new jumpsuit!! Jumpsuits for life. A jazzy jumpsuit – perfect for summer. I am thinking about making Marilla’s jumpsuit in denim (made the dungaree dress and dungarees) but want to sew some summer clothes first. Jumpsuits are great fun. 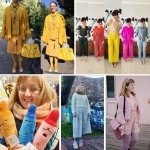 My goodness, I just LOVE reading other people’s blogs about unexpectedly cool makes- they can be so inspiring! 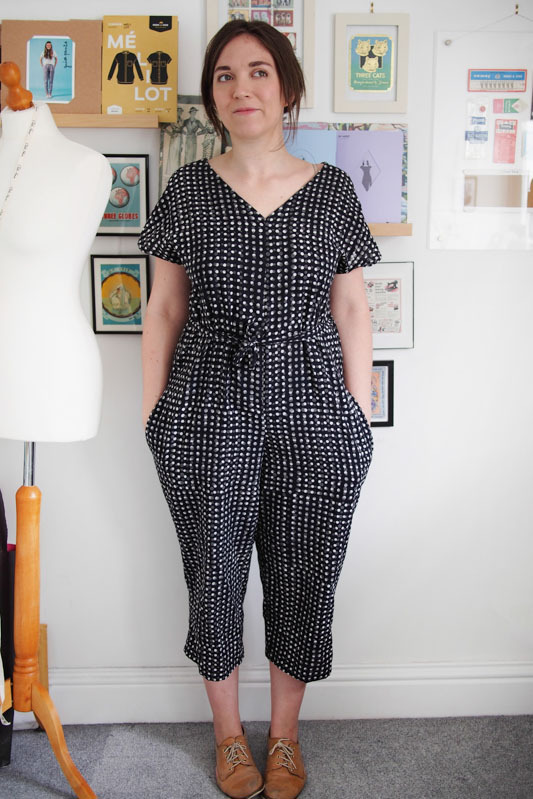 I would never have picked this pattern up for myself just by looking at the line drawing and the styling on the cover of the pattern, but it looks absolutely wonderful on you and I love the relaxed fit that somehow still provides enough shape to keep from swallowing your whole body up. Sometimes I have to wonder whether or not I have any actual creativity myself or if I am just great at copying other people’s great styles! Thanks for sharing, I am adding this to my queue and I can’t wait to try out the fabric from the etsy shop you mentioned! 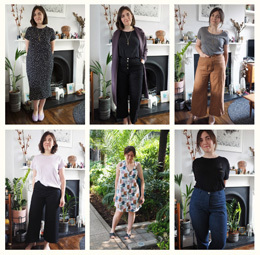 Big fan of your makes too Jasika, and I hear you on copying ideas – I swear all my sewing plans come from other people or rtw clothing I want to knock off – no shame! That jumpsuit is such a beauty! 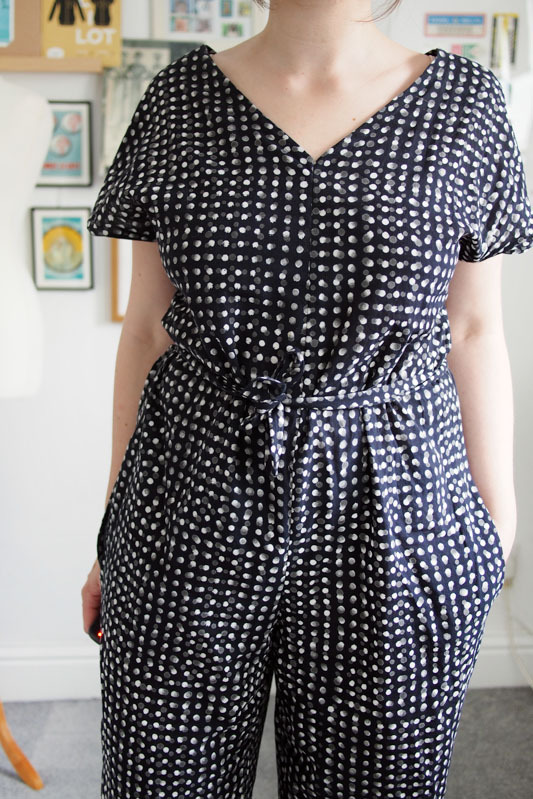 Oh my, this jumpsuit is so pretty, I instantly fell in love! And it looks so adorable on you! Thanks! And yes totally agree on Clarks comfiness. Your version looks so much better than the line drawing! 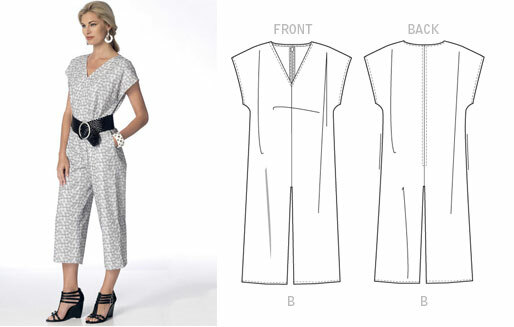 Do you have a “guideline” or some other way to decide which fabrics are suitable for jumpsuits? I have a tendency to pick too stiff and/or too heavy fabrics because I’m afraid that they’ll be see through or show every lump and bump. I definitely go lightweight and drapey. You can even get away with a tiny bit of sheerness since it’s close to the body. Rayon/viscose or lawn weight cotton are my favourites. Lady I give you full props for seeing past that teletubby line art. very cute. Loved the jump suit as soon as I saw your post on instagram Ii would have never considered a jump suit until I saw your post. I made one this weekend in charcoal chambray. Made the size smaller than I would normally still lots of room. It’s so comfortable to wear. Thanks for your inspiration. I agree with many of the comments…I never would’ve chosen this pattern until I saw your version, so good on you for being creative enough to see the possibilities. I am in the middle of sewing it up now! And you’re right — it’s definitely terrifyingly like a clown suit, but great with a belt. Thanks for the inspiration.